A lot has been written about the new pearl of Spanish cinema industry: Planet 51. The Spanish movie that counts with the biggest budget so far arrives to the big screen developed by Ilion Studios, a company owned and directed by the same talented people who created years ago the videogame saga Commandos, one of most successful ones around the world. FREE! Magazine had the chance to shoot questions in an exclusive interview with director Jorge Blanco, who tells us about his beginnings in the videogame industry, the challenge and satisfaction of putting together a project like Planet 51 and the interesting future plans for a Studio that is trying to compete from Europe and give more than one headache to the huge American ones such as Pixar or Dreamworks. Thanks a lot for your time Jorge! One of the first sentences that you can read in the media about Planet 51 is “The Spanish movie with biggest budget in the history”. For you, as main responsible of a film that will be released in 170 different countries, is this an extra motivation, or a reason to feel more nervous about the results that will be obtained? It is always a great motivation to work on something that will be watched by so many people. The good thing about such a big budget is that you can really work with the necessary tools and resources to achieve the average quality of a great animation production. I know that you worked previously with Pyro developing the videogame saga Commandos, but for the people who have not Heard about you, can you explain a bit more about your background, how did you start in the videogame industry and how happened the jump to making movies? I was 20 when my brother, Alberto Blanco, introduced me to the videogames world. He had worked already as a programmer for games for Spectrum, so at home I have always been surrounded by that kind of digital creative environment. I worked together with him in a small company making graphics for small videogame projects. It was the time when CD technology was getting born and all related to multimedia. 3d animation was also starting to take off and I learnt a lot working on those little projects. Later on, I was involved in the creation of Pyro Studios, the company behind Commandos. 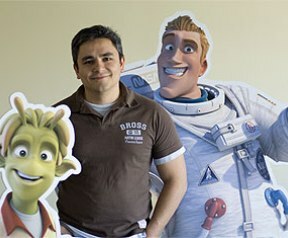 There in Pyro I met Javier Abad and Marcos Martínez, the other co-directors of Planet 51. At that time we were making Commandos 2. After finishing Commandos 2, Ignacio Pérez, president of Pyro, told us about his plans to build up an animation studio and we could not resist to the idea. Videogames were not challenging enough anymore from an artistic point of view. So the 4 of us spent 8 months looking for a good story so we could settle the foundations of the animation studio. You have worked so far creating the most successful Spanish videogame around the world, and now with the most ambitious Spanish movie ever made. So we could say that for you it is natural thinking big, isn´t it? Well, my professional life has been linked from the beginning to Ignacio Pérez Dolset. These huge projects were foreseen by Ignacio, so my merit is just about to take them and try to finish them successfully. For example, with Planet 51, the idea at the beginning was just creating a short movie, but Ignacio pushed us directly to turn it into an international film. Which is from your point of view the best thing about working on the creation of a movie, compared to the creation of a videogame, and which one is the most difficult thing? A movie reaches all kind of audiences, opposite to a videogame that counts with a more specific audience. I like that my worked could be enjoyed both by my mother or my 11 years old nephew. As well, the freedom of creativity in Planet is much bigger than in Commandos, where the graphics had to depend also on the game being easy to play. I have read that you commented in past interviews that making this movie was much more exhausting tan creating any videogame. Have you spent many days working until late at night in the studio? Well, we had a great load of work in Commandos, but it is not comparable to the work with Ilion-Planet 51. The scope of the project, the time and ambition dedicated to it has been very superior to anything made in Commandos and Commandos 2. All the members of the team has worked really a lot! How is the experience of working with Javier Abad and Marcos Martínez as co-directors, and being backed up by Pérez Dolset brothers? Did you have the final word in the decisions, or everything had to be agreed with the other responsible people of the Project? Working with Javier, Marcos and Ignacio was really a big thing in this Project. As I said, I met them in the past while working in Pyro and working all together is really great. We work very well as a team, everyone in our own responsibilities and fields, and this was a key point for Planet 51 shining artistically. Work was always made as a team, and then I had the final word for trying to move on in artistic decisions that would not be shared by everyone. Ignacio created a real “paradisiacal” atmosphere for what we are used to dealing with in the Spanish industry, where we had all the resources and support needed to complete Planet 51. Apart from the famous actors from Hollywood that lent their voices to the characters, another strong point is the script by Joe Stillman, creator of Shrek. Were you the ones who contacted him at first, or how did you start this collaboration? Did you not have in mind any Spanish scriptwriter? We produced at first 3 sequences of the movie. One was that one of the astronaut arriving to the planet and landing the flat with the barbecue in the background. Our American producer showed it to Joe, and he fell in love with the idea of the film. This encouraged him to join our team. I must say that working with Joe has been really wonderful. He has been involved in the project 100% and offered us a continuous help. There are some directors who like to include in their films some “national winks” (for example, Finnish Renny Harlin always places some Finnish flag or a Finnish beer or something like that in some sequences of his movies). Did you think about doing something similar? There are some little winks, although they do not make direct reference to Spain. In a sequence you can read the number 112 in a post box, which is the number of my own house. The astronaut´s MP3 has a tea kettle as a logo, and that is the favorite icon of our technical director Gonzalo Rueda, and for example in the fish bowl you can see two plastic corals in Brown and pink colors; that is the logo of a website about aquariums that I founded years ago. Ah well…and we also have in the soundtrack the famous “Macarena” song… hehehe. And talking about winks to cinema history, there are also many of those to classics like Aliens, Back to the Future, E.T, Star Wars, Wall-E, etc. Is it difficult to make a movie that pays homage to the genre and at the same time has something new to offer? Was there a time that you had to stop and say “ok, no more references to other classic sci-fi movies? 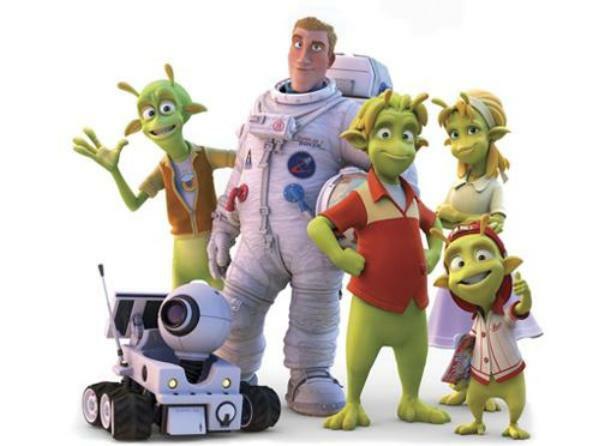 Well, I think that the main concept of Planet 51 is already very fresh in the genre. We are talking about an astronaut turned into an alien! That was something new. About the other references, well, some like for Aliens or Star Wars were almost compulsory to appear! Is the team in Ilion Studios formed basically by Spanish staff, or is a melting pot of different nationalities? What was the official work language used? Yes, we are Spanish in around a 70% of the team. The official language used was Spanish as well. What does a young talented guy need to be part of Ilion team? Do you hunt for people outside, or do you just choose among applications received? I think the most important thing is that they enjoy and feel passionate about their work, if not, it is impossible to work in this field. We recruit in the both ways you mentioned, but usually most people are selected based on the reels they send to us. You have also spent the last couple of years working at the same time in another movie. I don´t know if you can tell us something about it. If finally the economical results of Planet 51 would not be the expected ones (although we are sure they will be), would this suppose a problem when facing new projects? Ilion is a solid Project from an economical point of view, and actually Planet 51 is already achieving satisfactory results. So there is no problem for the development of our second movie. Where do you see yourself in the next years? Are you still “hungry” for new big projects, no matters how huge they turn to be? For the moment I still have 3 years of work in this new project, and then time will tell what happens next.